Pole Height: 28". Base Dimensions: 9.5" W x 10.5" L. Base Weight: 2.1 lbs. Innovative 9109-D dual monitor stand raises two flat panel monitors off the desk, saving space while improving productivity. The included freestanding pole mount base provides fast setup, making it ideal for the office environment. 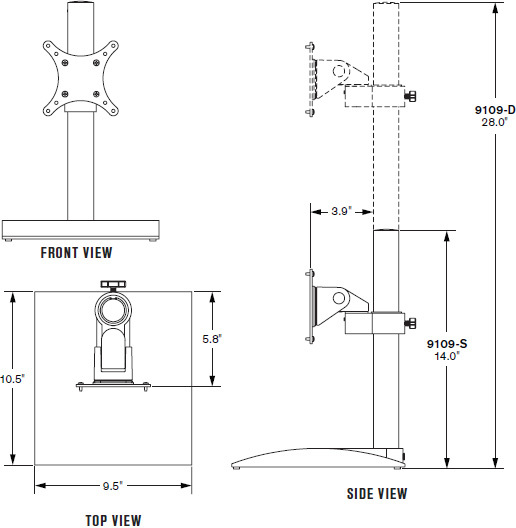 The Model 9109-D desk stand mounts two monitors, allowing independent pivot and tilt to the desired height and angle. This dual monitor stand enables each monitor to rotate 90° to view in landscape or portrait format. A freestanding base provides instant setup, making it a user-friendly dual monitor stand for any office environment. Base Dimensions W: 9.5", L: 10.5"